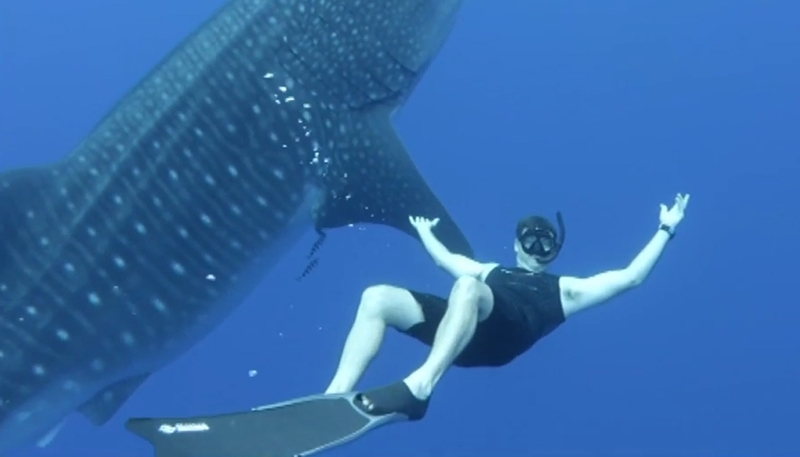 Clarke Gayford has described the dramatic moment he was pinned against a boat by a whale shark. The Fish of the Day host was invited to catch fish for a local restaurant while in Rarotonga with his partner Jacinda Ardern, he told The Project. While the Prime Minister engaged in diplomacy, Gayford found himself facing quite a different challenge: two curious whale sharks. When one began circling their fishing boat, he swam with one of the sizeable creatures for the very first time. The crew encountered a second whale shark, which was a little more assertive when Gayford got into the water again. “I went over the side of the boat and it came straight up underneath me. I didn’t have a chance to get out of the way,” he recounted. Gayford’s leg was momentarily caught between the shark and the fishing boat, making for a memorable experience. Whale sharks have no teeth so he wasn’t afraid of being eaten, although he says you can never be sure. As an experienced fisherman, Gayford’s been around plenty of sharks in his time. “Sharks are a sign of a healthy ocean so it’s quite encouraging when you get out in the water and actually see one,” he says. However this was his first up-close encounter with a whale shark, which he says has long been a dream of his. “One of my earliest childhood memories is sitting in Room 5 of Makauri Primary School and Mrs Rutherford the teacher was there, and I was on a coloured mat – and I remember telling her about whale sharks,” he explained. He also revealed his startling lung capacity. Out in the open ocean he can hold his breath for about one minute and 45 seconds. He says learning to spend more time comfortably under water isn’t as hard as it looks.